That being said, it doesn’t hurt to have John Oliver remind us all just how offensive the mind and politics of the U.S.’s number two political dude continue to be. 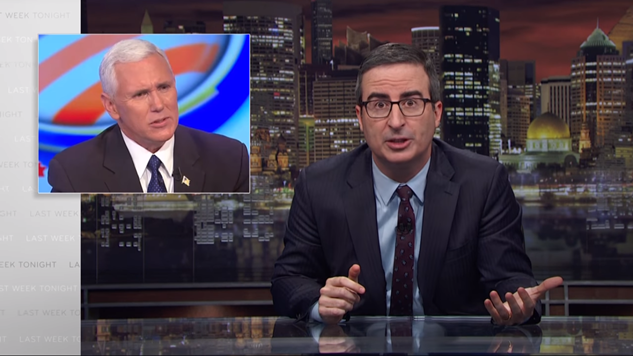 Sunday’s episode of Last Week Tonight took aim at Pence, outlining just how long and deep his efforts to undercut the advancement of marginalized communities run. Oliver highlights Pence’s association with the completely debunked and incredibly dangerous practice of gay conversion therapy. While his official campaign website uses clever language that allows him to disavow direct association with the pseudo-science, his continued support of glorified homophobe Dr. James Dobson and organizations like Focus on the Family connect the VP to the practice’s most vocal supporters. He has continued to offer support to the organization even after Dobson’s departure, appearing at Focus on the Family events as recently as 2017. He is even including a stop at the organization’s headquarters in Colorado during the book tour for a new children’s book based on the family’s pet bunny, Marlon Bundo. Pence’s stance regarding women was also brought to the spotlight once again. While it is incredibly easy to mock the ashen weasel for the laughable yet foreboding policy he holds that disallows him from being alone in a room with a woman who isn’t his wife, his heated gender politics are far less laughable. His public dismissal of women’s right to serve in the military dates back to the ‘90s, and his comments have only grown more divisive. Most recently, he claimed that abortion would hopefully be a thing of the past by the end of the Trump administration. A lot of what Pence represents is difficult to mock, but Oliver’s ability to take the only redeemable quality of the Pence family and perfectly repurpose it creates the perfect troll of the most staunchly anti-LGBT member of the Trump administration. Oliver announced the release of a separate children’s book based on Marlon Bundo, but this book tells the story of the bunny falling in love and marrying another boy bunny. Marlon Bundo wants to marry that boy bunny, and no silver-haired stink bug is going to stand in their way. That bow-tied bunny is the best possible way to get under the skin of the hateful man. Even better, the proceeds from sales of A Day in the Life of Marlon Bundo go to charity organizations The Trevor Project and AIDS United. Check out the episode below and check out Bundo’s love-filled adventure here.